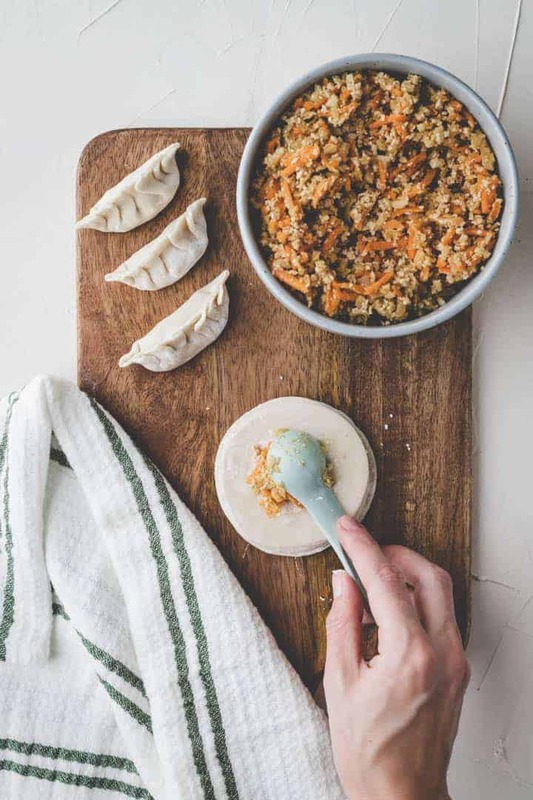 These vegan dumplings are filled with Asian seasoned tofu and vegetables and should be enjoyed with the traditional dumpling dipping sauce. 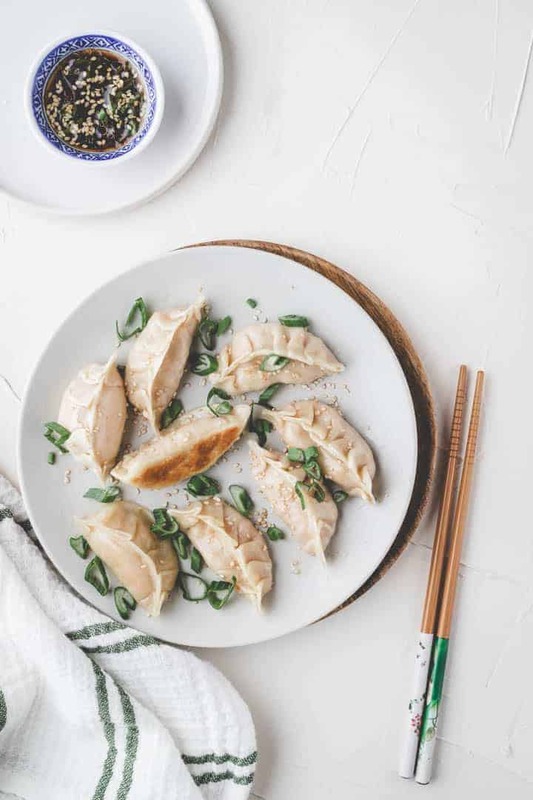 One of the best gyoza recipes ever – and I will teach you how to make them! 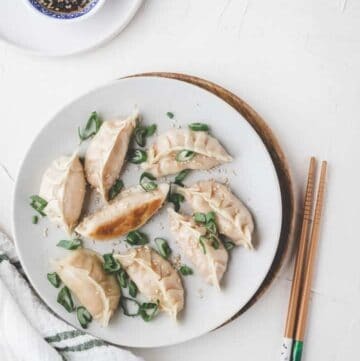 Japanese dumplings, also called gyozas, are one of my all-time favorite things to eat in the world. 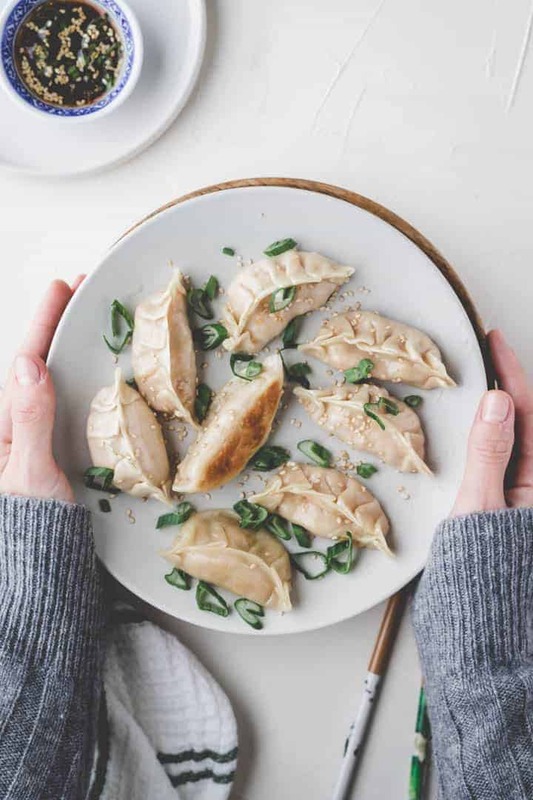 The homemade gyoza wrappers (wrappers = dough) are softly steamed with a crispy bottom and filled with deliciously marinated tofu and vegetables. 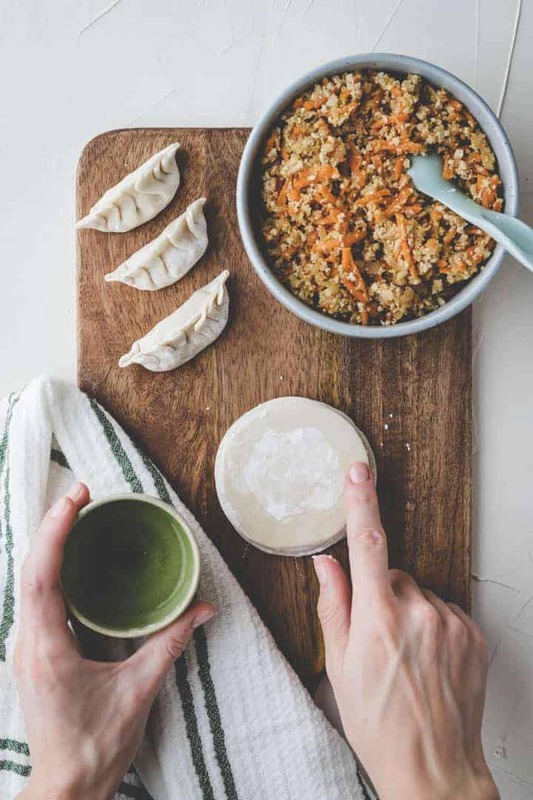 It’s a must to enjoy these vegan dumplings with the traditional salty sour dumplings sauce. Why am I a dumpling expert? I am not Japanese, but I dare to call me a dumpling expert. I discovered them the first time in Melbourne (in a small Japanese restaurant), but couldn’t find them back in Switzerland. 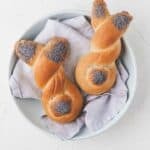 Therefore, I started to cook them by myself and have done them countless times. And I receive a lot of compliments for my homemade dumplings (not to swagger, just to let you know this recipe rocks). 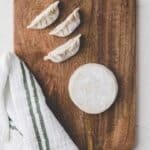 Let me teach you how to make these delicious vegan dumplings and how to fill, cook, and freeze homemade dumplings in general. Prepare the vegan dumpling filling and wrappers. 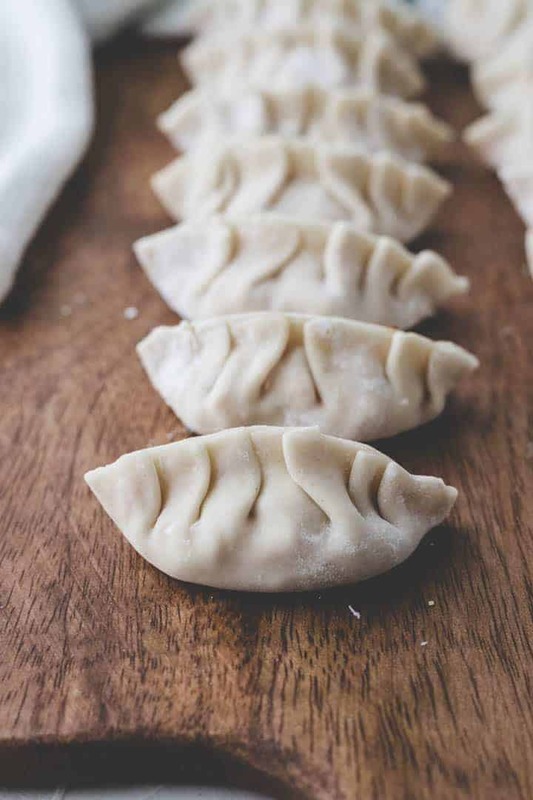 I recommend using homemade gyoza wrappers, but you can also buy frozen ones in the Asia market. If so, take them out of the freezer a few hours before starting. Using your finger, make the outer part of the gyoza wrapper moist. This helps that the dumping is going to stick together when folding. 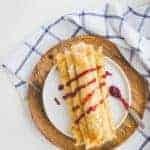 Add about one teaspoon of the filling in the middle of your wrapper. Fold the wrapper into the middle and arrange the filling using your fingers if necessary. Starting in the middle, make 3 pleats each side (right & left) using your thumb and index finger. Make sure to watch the short video – it’s easier when you once saw how to do it! The best way to enjoy dumplings is when the bottom is crispy and golden brown, and the rest of the dough is steamed. To achieve that, follow these simple steps. Fry your dumplings for a few minutes in sesame oil until golden brown at the bottom. Add water, close the lid, and steam them until the water has evaporated. Remove the lid and cook for a few more minutes until you have a crispy bottom. 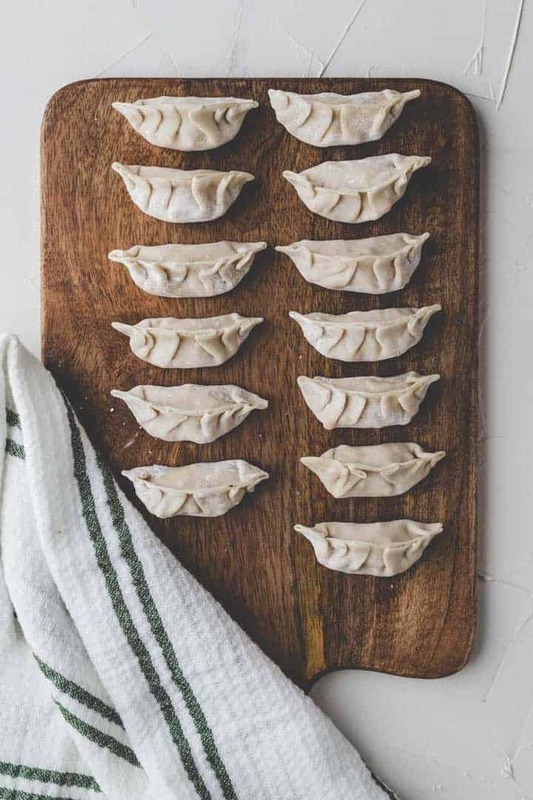 Alternative: Cook dumplings for a few minutes in boiling water. If you make dumplings, it’s better to make a large badge once and freeze some of them. Freezing the dumplings individual is important. If you have a small freezer, this is the best way. Lay an aluminum foil on the bottom of your freezer drawer. 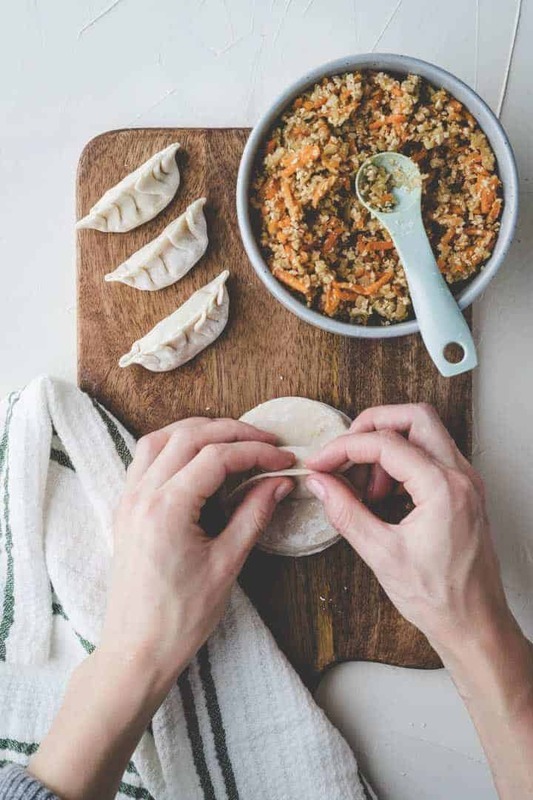 Carefully place each dumpling on it, make sure there is space between each one. Otherwise, they will stick together. Let them freeze for about 2 hours. When they are frozen, you can transfer all of them into a freezer zip bag – they don’t stick anymore. Cook them frozen (not thawed) the same way than the fresh ones and steam for about 2 minutes longer. Mix sesame oil, soy sauce, and sushi vinegar. Heat coconut oil in a skillet. Add minced onion, garlic, ginger and cook for 3 minutes. Shredd your veggies and tofu in a food processor. Add it with the spices to the skillet and cook for 5 minutes. Transfer in a bowl and leave it to cool down for a few minutes. 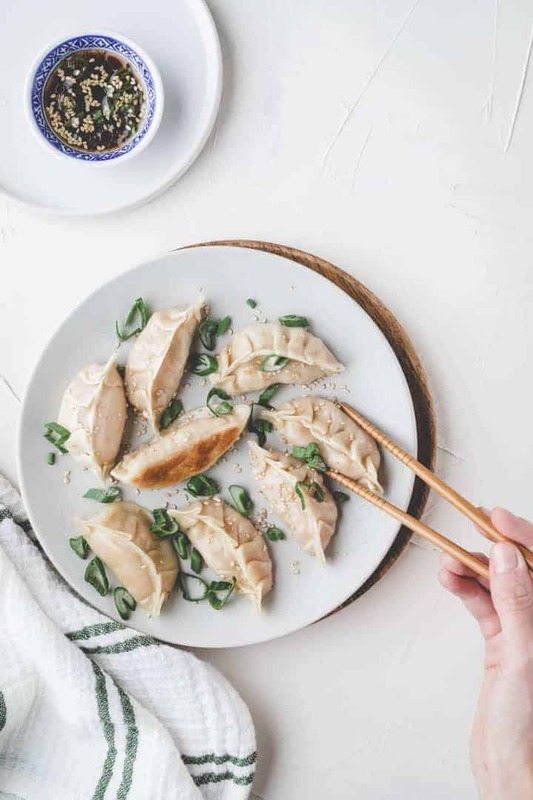 Fill each gyoza wrapper with a heaped teaspoon of the filling. 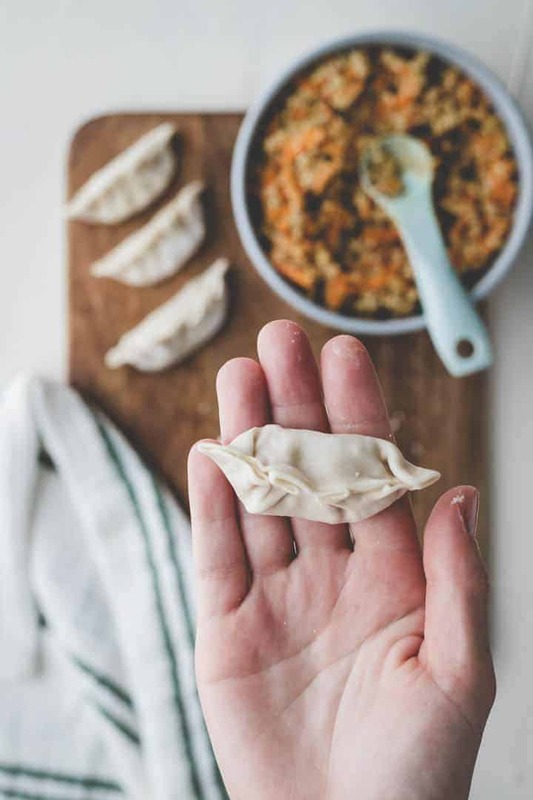 Fold and close the dumpling. 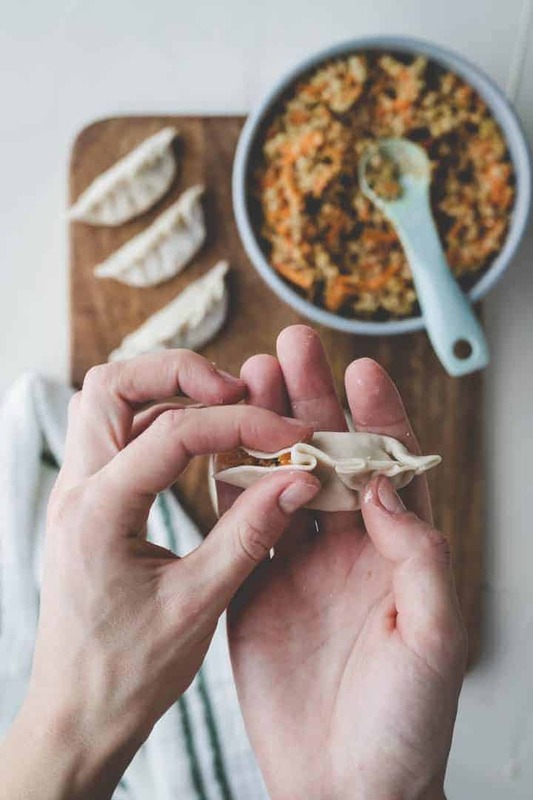 See above in the blog post and in the video how to fill and fold dumplings. 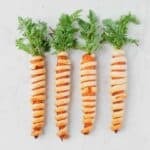 You can store them up to two days in your fridge or freeze the part you don’t eat right away. Heat one tablespoon of sesame oil or another oil in a skillet. 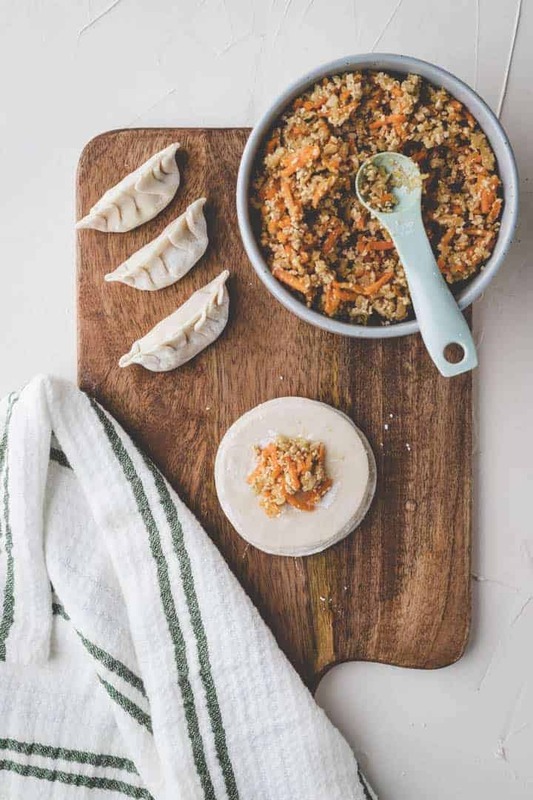 Add as many dumplings as fit, but don’t stuff them. Otherwise, they will stick together. Cook for 3 minutes until the bottom is golden. Add 1/4 cup water and a lid. Steam for 5 minutes. Remove the lid and leave them for another 2 minutes, until the bottom is crispy. Mix the dipping sauce and serve with the cooked gyozas. 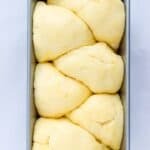 You can freeze the uncooked dumplings. 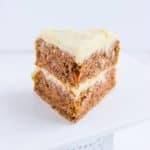 Place them on an aluminum foil in the freezer for about 1-2 hours – make sure to leave some space between each one to prevent them from sticking. When they are frozen, transfer to a freezer bag and store in the freezer up to one month. Cook them right out of the freezer, don’t defrost, and steam 2 minutes longer. The use of sriracha or sambal oelek is optional and gives an extra flavor if you like it spicy. Add sesame seeds or chopped scallions to your dipping sauce. 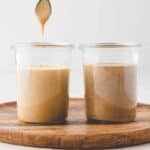 Smoked tofu does contain less water and is my favorite for cooking. You can also use regular tofu, but make sure to press out the water before using it. Thank you for letting me know Luiza! 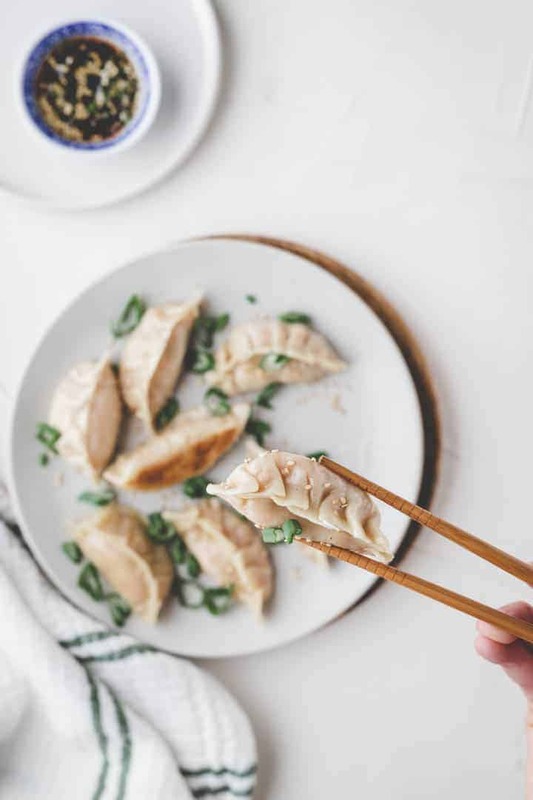 Dumplings are such a fun thing to eat! Your mum must be very lucky if you cook for her ? 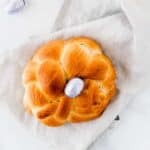 Made this today and they were so easy to make and they taste awesome ! Thank you for your kind words. I am so happy to hear that it was easy for you to make them! And yes, Dumplings are super delicious ?Have a wonderful Sunday! 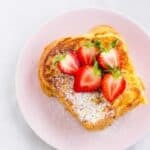 It’s looking soo beautiful and delicious ? Thank you so much, Yogesh! 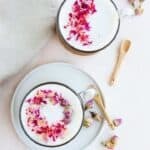 I hope you find the time to try the recipe ?